that's the first step, right? Admitting you have a problem?? So, y'all don't go calling the Hoarders producers on me, but HOLY COW!!! I was trying to organize my sewing room, as it was a disaster from Stash Game and my frantic trip to Hawaii that left everything a shambles and resulted in more fabric and books coming in. Not good!!! I cleaned and straightened, and partially organized, then realized that this heap below was a huge problem. I have no where to put it. The whole box is adult apparel fabric. 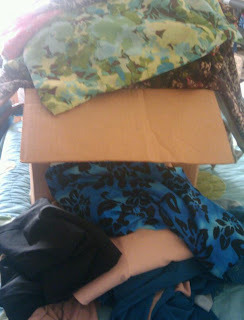 The small heap is swimwear fabric, of which I now have enough to warrant a "special place" for it...but WHERE??? My original system, in Commerce, was a series of wide shelves around the top of the room, 18" from the ceiling. 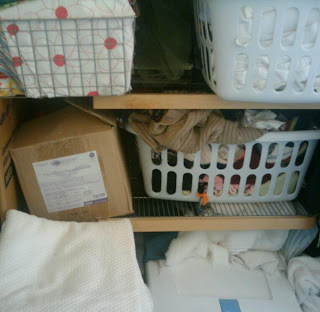 On these shelves were white laundry baskets, with the fabric neatly sorted into them. Moving here, this system fell totally apart. For one, I don't have that much shelving. Secondly, I now have far more categories than laundry baskets. Here on the left, top shelf, is felt and some fleece. 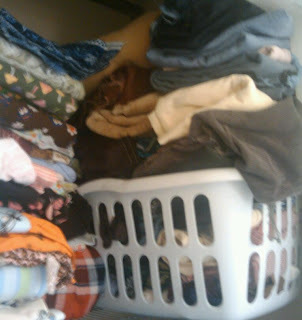 To the right of it you can see knit prints, but behind the knits prints is a stack of fleece. All the shelves are two stacks deep. Of the baskets below, the one on the left has sling fabrics, and a few other things I've failed to categorize, and on the right are my "boy" woven prints. This is just one basket-width over. The top shelf is knit prints, with the layer behind being flannel and some fleece, and a bit of other heavy weight stuff. Below, on the right, are woven adult apparel fabrics. Lots of vintage in this basket. The basket on the left is the "boy" woven prints in the previous picture. This is the far right of the top shelf. 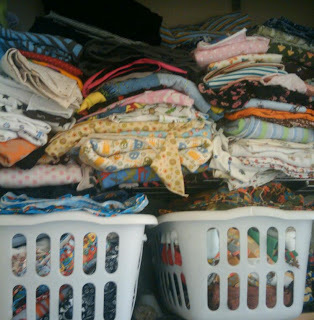 On the left, a stack of miscellaneous knits and flannels, on the right, a VERY over-flowing basket with mostly bottom-weights: denims, cords, herringbones, wools, etc. Also, tho, at the bottom of the basket are some brocades and vintage silk. This organization is astounding, huh?? On the lower shelves: these are not as wide as the two upper shelves. 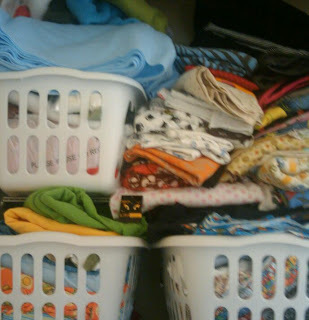 The top left basket is girl wovens, the top right is diaper fabrics. Below it is a basket of longies, ready to be sewn. 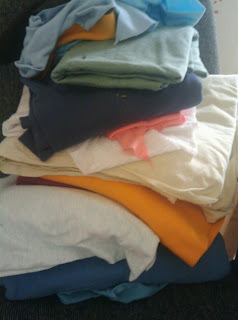 On the bottom left is a stack containing some french terry, wool for coats, and a cool quilted cotton (for apparel, not for blankets), and the lidded bin is the "fancy fabrics": satins, velours, lame, shiny vinyl, etc. 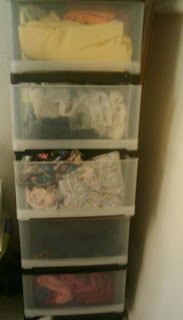 This is where most of my solid knits are. it used to house ALL of my knits, but I've been moving the prints to the shelving and moving all the solids here. A stack of solid knits to be put away in the drawers above. I need to go on a fabric diet and just sew all of these up, BUT I'm still going to have to get some khaki twill and some red and white interlock and ribbing for William's school uniforms for fall. HELP!!! I need a new system of organization. I use up more of my fabric when I can see it, obviously, and I can't really see ANYTHING with it stored like this!!! IDEA! Share with your sister!! Lol. Joking! Good luck! I can come over one day and help you with it. Can u put up more shelving? I'm like you, but I don't have as many. I ended up putting all of the solids in boxes that aren't clear. I also have some other boxes that aren't clear and just snapped a photo of the fabrics and wrote on the back of the photo which box those fabrics are in. I then put those photos on my inspiration board. I then asked my super organized cousin to organize my ribbon and ric-rac into this handy tool case (actual purpose is for actual tools) that I picked up on Black Friday for less than $10. I had to sell books and eliminate some display photos on my shelf and use that space to store the boxes.